Virginia Beach-based life & food blogger. 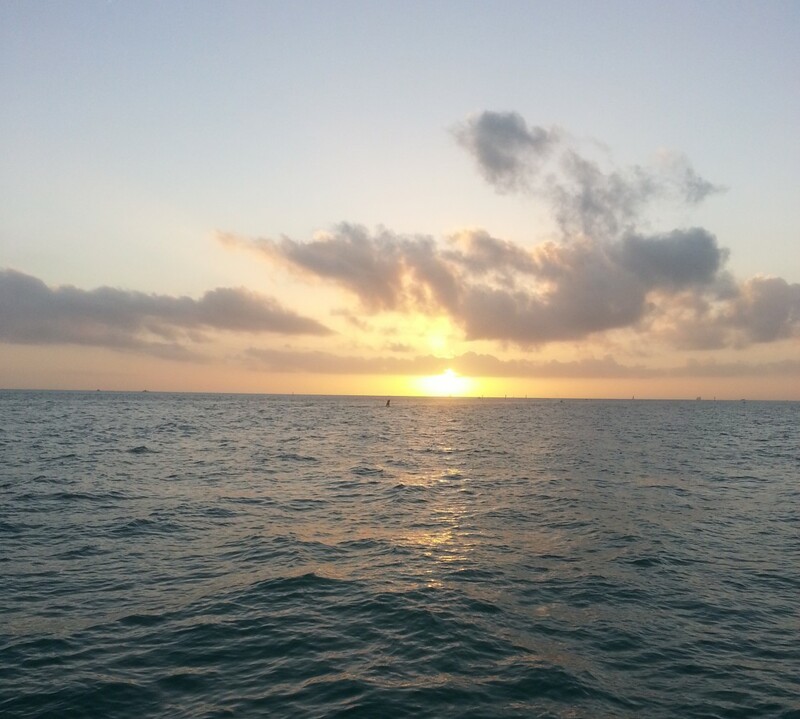 Obsessed with the ocean, good food and always in the mood a glass of Sauvignon Blanc. 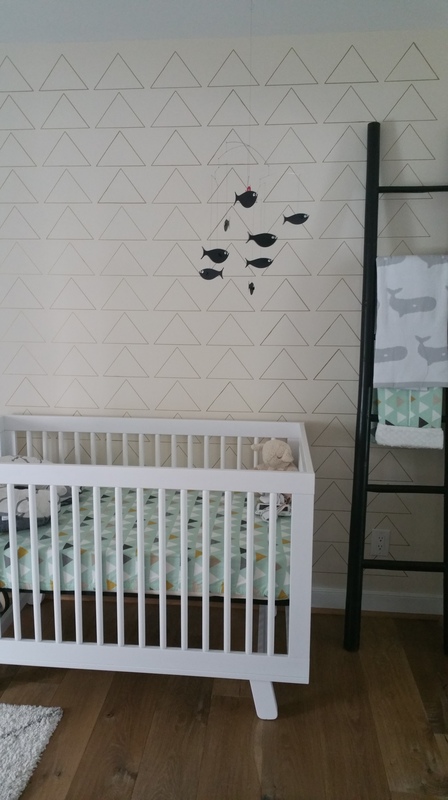 Hudson’s nursery has been dubbed the most well thought out and peaceful room in the house by Dad. 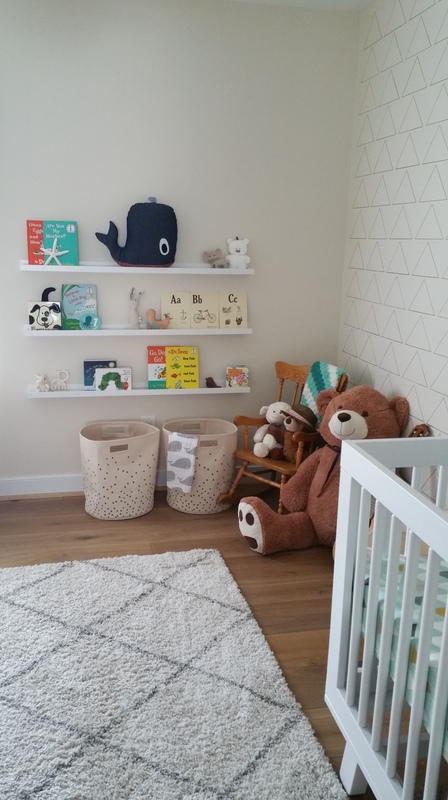 I must admit that I spent many hours on Pinterest when I was pregnant getting familiar with baby products and deciding what I wanted our little ones room to look like. My disclaimer is to say that these designs aren’t original but instead are a mesh of “found” styles that I put together. I preferred the look of the gender neutral nurseries. I wanted a room that I would want to spend time in but could be easily converted to another use at any time. Of course, another advantage of a gender neutral nursery was that we were waiting to be surprised by our baby’s gender! 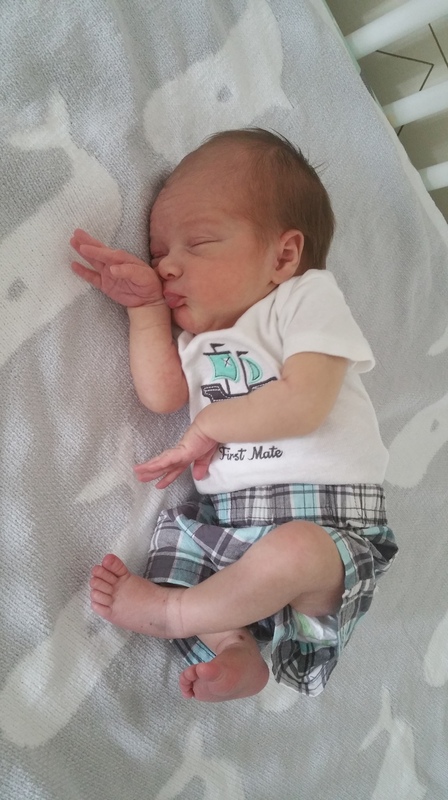 After 8 long months of waiting we had a boy (he was born 4 weeks early) and he fits right into the space I imagined for him. The first design element that I fell in love with was this DIY Sharpie Wallpaper from Vintage Revivals. I wanted it for an accent wall behind the crib. 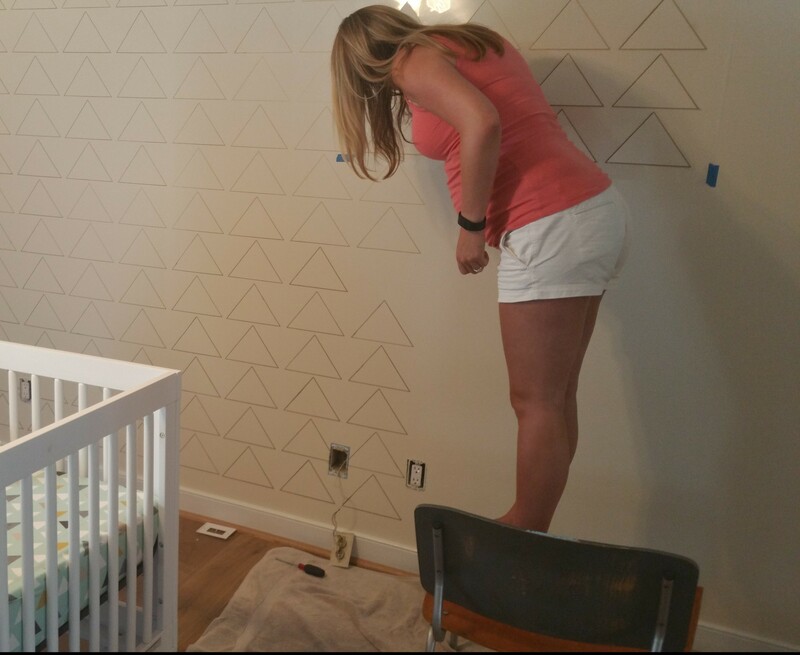 The amazingly talented lady behind this site leveled and drew all of her triangles by hand!! Knowing that this would never work for me, I set out on a search for a comparable stencil. After more hours of Google searches I decided on this triangle stencil from OliveLeaf Stencils on Etsy. I started in the top left corner of wall, taped the stencil down with blue painters tape and traced the outline of the triangles with gold Sharpie paint pens. When I was done with the first section I moved the stencil over and overlapped the last row of triangles to keep it straight. The paint pens were easy to work with for the most part. Every few lines I had to stop and shake them to keep the paint moving. It took 4 pens to get the whole wall done. I did make a few mistakes when I moved too fast or worked too long and my hand got tired. The mistakes were easy to cover up though! I used a small angled artist paint brush dipped in the wall color and they were easily covered. 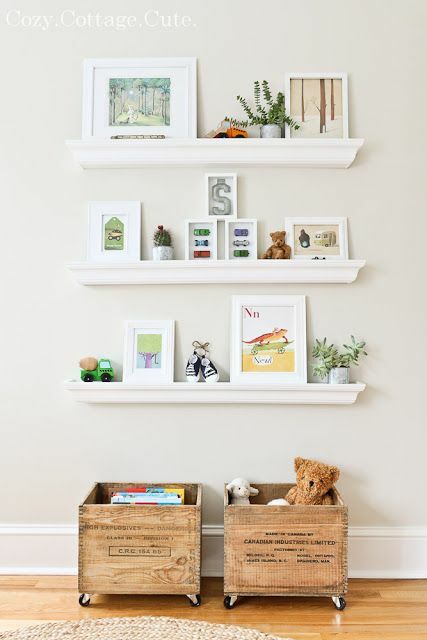 There are many 80 million examples of book ledges on Pinterest. I MAY be exaggerating a bit but just do a search and see for yourself! My favorite were the wider ledges (versus the shorter spice rack versions). I also liked the idea of starting the first ledge low enough so that I small child could easily walk up and grab a book (I started the first ledge 24 inches from the floor). The 3rd element I wanted to copy was to use a couple of bins or boxes below for toy storage. The ledges themselves are 45 1/4 inch white Ribba Picture Ledges from Ikea. These were my inspiration book ledges (source unknown). 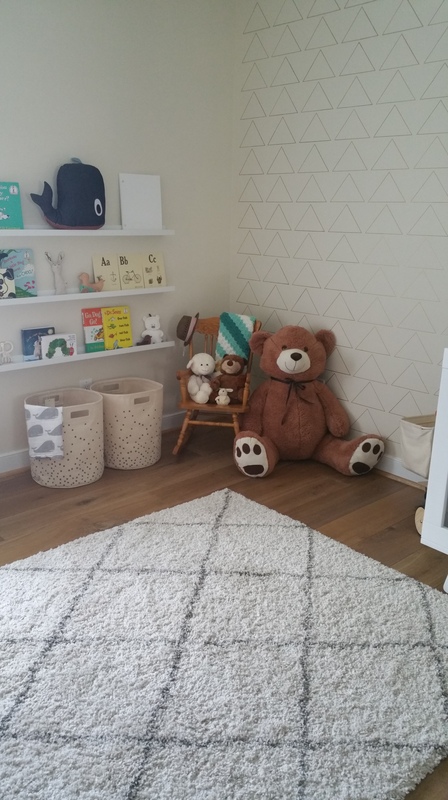 I chose canvas bins with handles instead of the wooden boxes because I thought they would be hardwood floor friendly and nice and light for the baby to carry into another room for playing (like the living room or kitchen) when he is older. 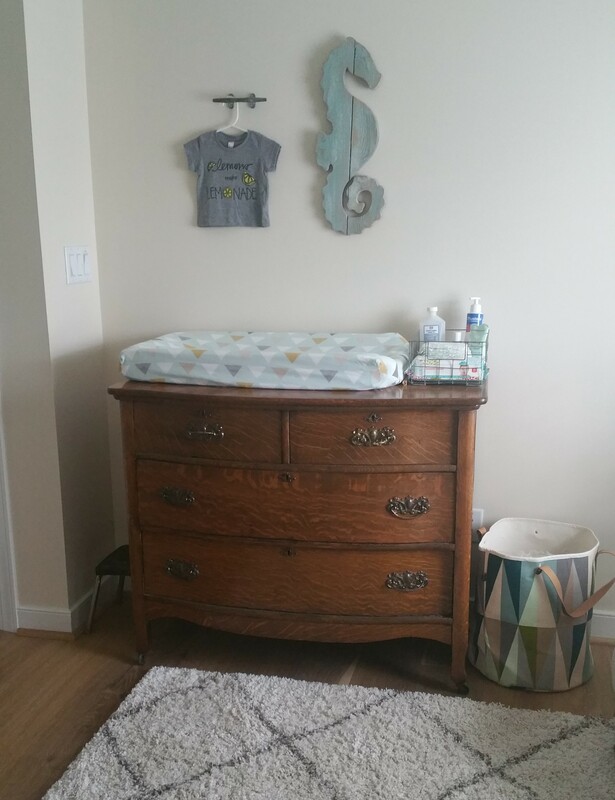 This antique dresser was the first thing that I bought for the nursery when I was about 15-16 weeks pregnant. The plan was to find an older dresser that I could paint with chalk paint and distress but when you find “the right one” you know it! I loved the key hole detail above the drawer pulls (they actually work, I just don’t have a key for it). The wood was too pretty to paint so I decided to leave it natural. Tip for dresser shopping: check out the height and width before purchasing. 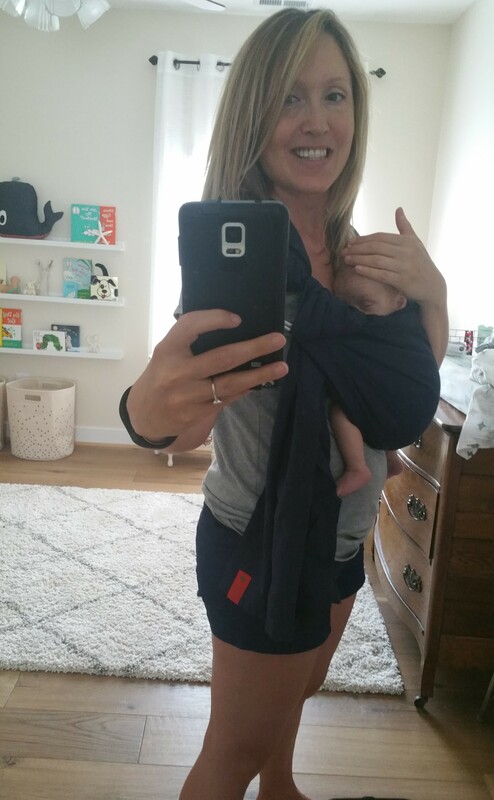 The height is important so that you aren’t bending over too far when changing and dressing your baby. 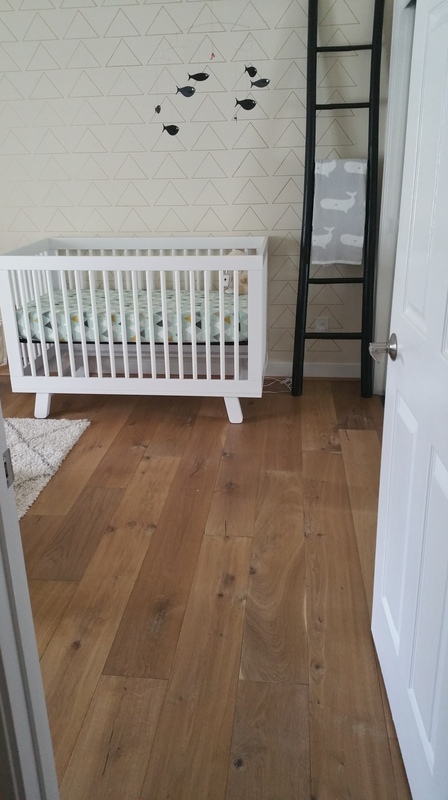 The width is important to make sure it’s long enough for the changing pad and any baskets or bins you might want to use on top. Hudson posing on his changing pad next to his diaper delivery! We signed up for the Honest Company monthly bundle. Bonus that they are made with natural stuff that’s not supposed to irritate baby’s sensitive skin and is better for the environment. So far my favorite designs are the baseballs, guitars, bicycles and giraffes. I snagged this chair from the living room to fill up the corner opposite the book ledges. Hopefully I’ll be replacing it soon with this swivel recliner. Babyletto Hudson crib from All Modern. An organic ColgateEco Classica III Dual Firmness Foam Crib Mattress mattress from All Modern. Dresser, antique, purchased from Craiglist. Dorado Ivory Area Rug from All Modern. Canvas bins from All Modern. Plan Toys shopping cart from Franklin Goose. 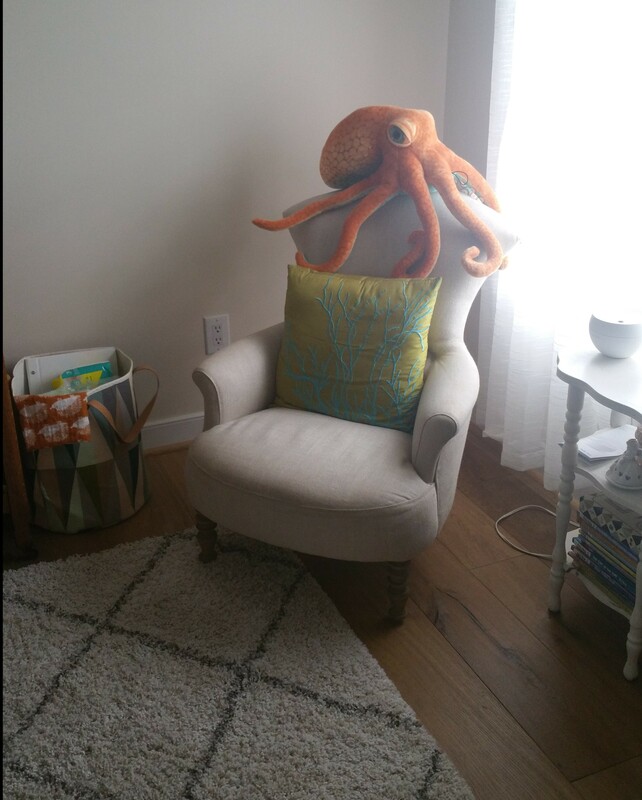 Whale cotton throw pillow (on the top shelf of the book ledges) is by Ferm Living also purchased from All Modern. Gray and white whale blanket from Nordstrom. Shoal of Fish mobile from All Modern. 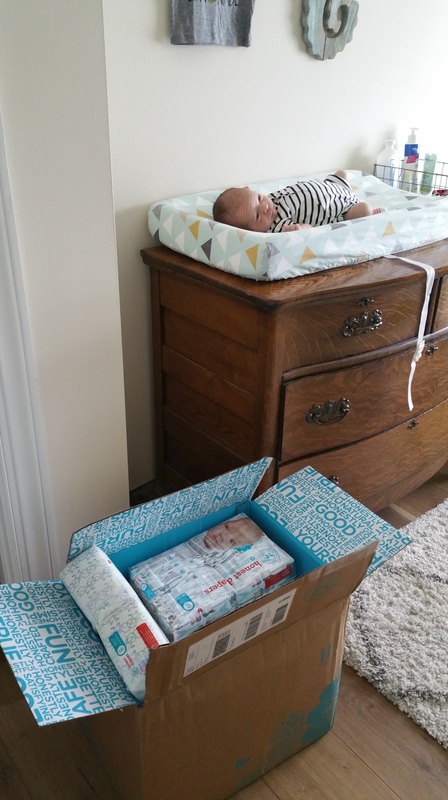 The crib sheets and changing pad cover are from Madly Wish. I used a 25% off coupon code advertised on Instagram when I got them. Lemons make Lemonade t-shirt hanging above dresser from Kate & James. I also had a coupon code for that. Wooden seahorse purchased at local farmer’s market, similar found here. Sakura Bloom sling wrap in Twilight. Triangle stencil from OliveLeaf Stencils on Etsy and inspired by this DIY Sharpie Wallpaper design from Vintage Revivals. White Ribba Picture Ledges from Ikea. Any questions or comments? Please let me know!